Promoting employees health is seen as some kind of fashion nowadays. Still we really hope this trend is going to stay. In case you work in an office and want to take care of yourself, ergonomics is the way: “the scientific discipline concerned with the understanding of interactions among humans and other elements of a system, and the profession that applies theory, principles, data and methods to design in order to optimize human well-being and overall system performance.” as the International Ergonomics Association defines it. In other words, that the furniture of our workspace can be adapted to the person. Which allows a perfect optimization of the space, by eliminating the dividing elements. Contrary to the cubicles, it also allows to take more advantage of natural light and doesn’t cause a confinement feeling to the worker. Adapting the furniture to the needs of the workers, not just to correct bad postures, but also improve its user physical conditions. This in fact is very necessary when our office work makes us lead a sedentary life. This, in turn, helps to increase the performance and motivation of the staff, who will feel much more in shape. 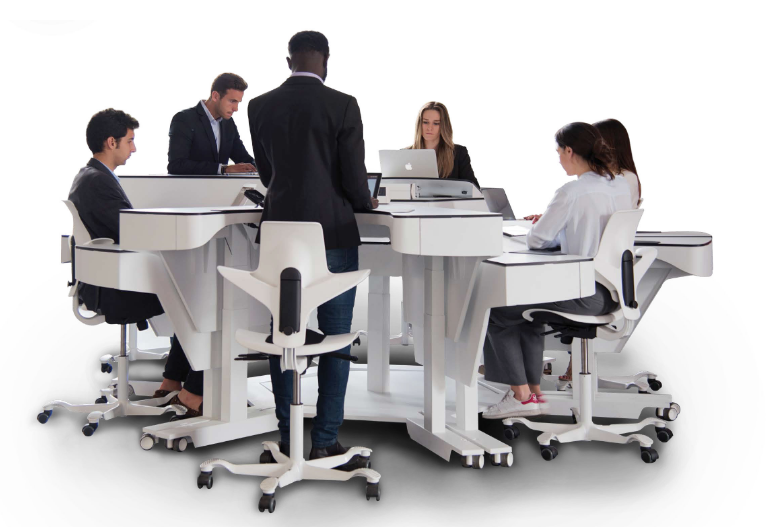 If in addition to adaptable they are also multifunctional furniture, they will allow us to organize meetings much more easily, like the Ergon Desk of AVP, which allows to reduce the loss of time in displacements thanks to its modular design oriented to continuous collaboration. Besides, its integrated App allows you to memorize and improve our habitual postures: here we take a step further, towards the "intelligent ergonomics" concept. Most of the inputs we receive in our workplace are visual, mainly for the computer screen. (Becoming our hardest effort during the day). So is our hardest effort during the day. Good lighting is vital to keep our energy at the required level for a full time job. Of course, natural light is the best one for this enterprise and we must take full advantage of it. We also shall combine it with artificial light strategically placed and with soft and neutral colors.